Jack is excited to be going into middle school at the Pirate School. He'll be one of the Fighting Eels now. He's planning on taking cannon lessons. However, everything doesn't work as planned. FlyRockit Publishing and Net Galley allowed me to read this book for review (thank you). How could I miss a pirate book? You can grab a copy for you now. This is great fun. Jack gets in trouble as soon as he steps on board. He has to take another math class and he hates it. The bully from last year is still in their class, and now he has to mentor an excitable first grader during lunch. Of course, with Anne Bonny starting and ending their classes with a muzzle shot, it made it a bit better. What Jack doesn't know is that Teach has a special relationship with Max and he is testing Jack. I really liked the mischievous behavior of all and the way the story ended. 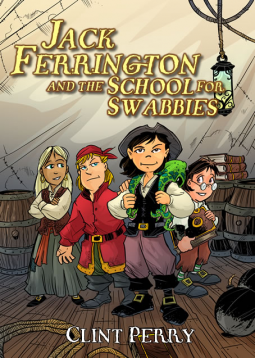 Any little pirate you might have in your household will love reading this book. After all, there's a food fight in it. Thank you so much! I look forward to sharing book two with you.